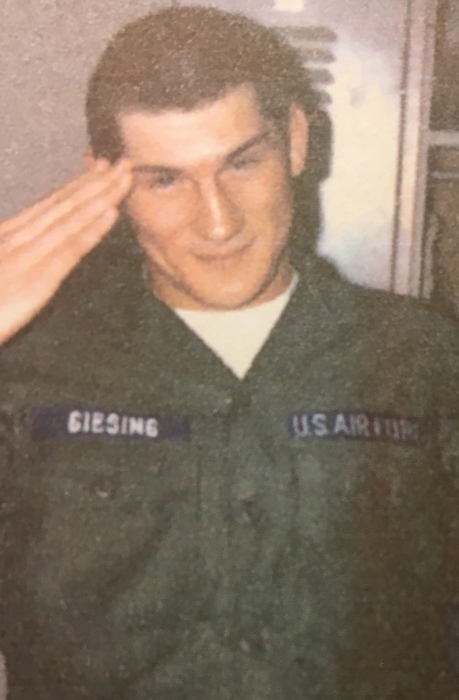 John “Johnny” Joseph Giesing, Jr, 68, of Cocoa Beach, Florida passed away suddenly, but peacefully in Cocoa Beach, Florida where he lived comfortably for 10 years in a townhouse near the beach. He was born in Taylorville, IL and attended Kincaid Grade School, Taylorville Middle School, and Kincaid High School. He played varsity basketball and was the only starter who could dunk the ball. Johnny went on to Southern Illinois University-C & majored in Mathemathics. After his sophomore year he took a job in construction in Shreveport, La. Johnny’s passion was music, he started playing drums at 14 & was a member of several Rock bands in the 60’s, 70’s & 80’s. His most prize possession was his Ludwig Drum Set & his music library could fill a record shop. If given a verse of a song he could sing the rest of the lyrics. Johnny was free spirit, always itching for the next adventure. Family members felt he had happy feet. He worked various jobs in the construction industry, including building the stratosphere at the Knoxville Worlds Fair. He joined his brother Michael in California & enlisted in Air Force in San Francisco. He went on to serve in the Vietnam War as a mechanic on F18 fighter jets flying out of Thailand. He lived all over the United States but always seem to move back to Kincaid or Taylorville. He also worked in Purchasing Dept for Milwaukee Children’s Hospital and was member of local band. Happy feet hit again & he went back to California to live with his beloved Uncle Jim Bernardini. Later in life in found peace in Florida. He lived in St. Cloud near Disney World & later moved to be close to the ocean. He loved to ride his bike to the beach & watch the surfers near Ron Jons along the Cocoa Beach Pier. He is the son of Yolanda Ann Bernardini Giesing & John Beryl Giesing & grew up next door to his grandparents Mario & Clorinda Bernardini & Aunt Tina. Being tight knit Italian family he was close to Yolanda’s brothers & sisters Mario, Eugene “Jim”, Louis, Bernardini & Kathryn Pleshe, Mary Katcher, Tina Akers & Dwight Giesing. Johnny is survived by his brother Michael Giesing Bernard, niece Morgan, nephew Brad & over 40 1st and 2nd cousins who lived in the area and probably have their own Johnny story to tell. Johnny did not have children but he treated his niece and nephew Morgan Anne & Bradley Michael Bernard like his kids. He adored them & loved giving them Johnny wisdoms (including drum lessons) and always remembering their birthdays & Christmas. A memorial service will be held at Masterson Funeral Home in Kinciad, IL October 13, 2018 at 10:00 A.M. Burial with full Military Rites by the U.S. Air Force will follow in Oak Hill Cemetery, Taylorville, IL.